We have this beautiful traditional style on clearance. 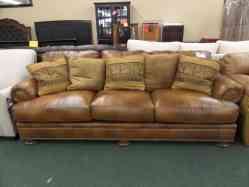 Features a warm tri-tone brown leather upholstery with nail head trim and 5 gold, red, and brown throw pillows. Dimensions: 55"W x 42"D x 38"H. Brand new condition, but it is discontinued. It can be yours for only $899 as is! Come visit our Tempe showroom for lots of other great clearance items! Visit our website at www.furniturecreations.com for brand new furniture and !